Dr. Vikrant Sharma is an expert laparoscopic surgeon with a keen interest in pelvic cancers and surgery for morbid obesity. 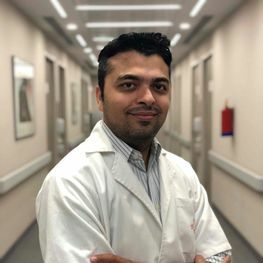 He has done his masters in surgery from PGIMS, Rohtak and a super speciality FNB (Minimal Access Surgery) from Galaxy Care Laparoscopy Institute, Pune and has completed his training in advanced laparoscopy and Robotic surgery. He has worked with Galaxy Care Laparoscopy Institute, Pune and Meenakshi Hospital, Delhi. He has more than 20 international and national publications and presentations to his name. He is also a member of the American Association of Gynae-Laparoscopic Surgeons (AAGL). He specializes in all kinds of minimal access procedures including Bariatric surgeries, Colorectal, Gynaecological and Gynae-oncosurgeries.